If you want versatility and utility for your daily commute, the 2017 Dodge Grand Caravan is a reliable and exciting minivan. This model is one of the most recognizable vehicles on the road, and it has built a reputation of offering a high-quality and comfortable interior, innovative electronics, and a great powertrain. For 2017, the Grand Caravan has received some changes, including a change to the trim lineup which now includes the SE, SE Plus, SXT, and GT. Later in the model’s production, Dodge will add a variety of standard features to the base SE trim, like a Blacktop appearance package, touchscreen interface, and rearview camera. The 2017 Grand Caravan features a great powertrain, which is dynamic, efficient, and capable in many driving environments. The standard engine found with the Grand Caravan is a 3.6-liter V6. It is linked to a six-speed automatic transmission, and it utilizes a front-wheel drive system. This configuration will produce 260 lb-ft of torque and 283 horsepower. This excellent minivan will offer a great driving experience, and it works to enhance fuel efficiency whenever possible. Customers can expect to get up to 17 miles per gallon (mpg) in the city and 25 mpg on the highway, which creates a combined fuel rating of 20 mpg. As stated above, the available trims have been slightly edited for 2017, but customers still have four outstanding trims to choose from. Additionally, each of these trims can be equipped with standalone features, and some of the main trims are offered with packages that will add even more style and technology. Every trim is well-equipped, and the Grand Caravan has been cited as one of the most economical and affordable minivans on the market. The standard features found in the SE include 17-inch steel wheels, tri-zone climate control, Stow ‘n Go seating, a six-speaker sound system, and a CD player. This base model can also be ordered with a Uconnect Hands-Free Group package, which will equip the vehicle with Bluetooth connectivity for both phone and audio, a USB port, a leather-wrapped steering wheel/shifter, an auto-dimming rearview mirror, and more. Every model will also be offered with a DVD entertainment system for the rear seats. This entertainment system has a 9-inch second-row display screen, satellite radio, an HDMI input, and two USB charging ports to make it easier to keep your devices charged. How much cargo space does the Grand Caravan have? When the second and third rows are properly stowed away the Grand Caravan can provide up to 140 cubic feet of space. I have poor credit – can you work with me to get a loan? What does the towing package include? The optional Trailer Tow Group will feature a load-leveling and height-control suspension, a Class II receiver hitch, as well as a four-pin connector wiring harness. This will enable the Grand Caravan to have a towing maximum of up to 3,600 pounds. The Grand Caravan is well-known for offering a safe and secure experience, making it a reliable option for families during their daily commutes. Standard safety features include active front head restraints, stability control, antilock disc brakes, and a driver knee airbag. The GT trim will also be offered with a Safety Sphere Group, which will equip the Grand Caravan with rear parking and cross-traffic sensors, in addition to a blind-spot monitoring system. If you would like to learn more about the fantastic new 2017 Dodge Grand Caravan, we would be happy to help. 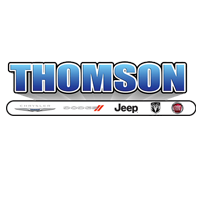 Just give us a call or fill out the form below to get in touch with us at Thomson Dodge Chrysler Jeep Ram FIAT!